I visited Shoezone this afternoon in search of a pair of slippers. I entered the store and had a browse round. Not one member of staff asked me if I was ok or if they could help me in what I was looking for. I finally came across the slippers at the back of the store. I selected a pair I liked and tried them on. As I was happy with them I preceeded to the till. The cashier (SL) which is on my receipt never acknowledged me or even said hello as she was deep in personal conversation with another store assistant who stood at the side of her. I found this to be most rude of them both. They continued there personal conversation the whole time I was stood there being served. I couldn't see either of there name badges as they were turned around. Personally when I am being served I would just find it polite if they stopped there personal conversation and then the cashier could have concentrated on me after all I am the customer. Without customers then the staff would be without jobs. 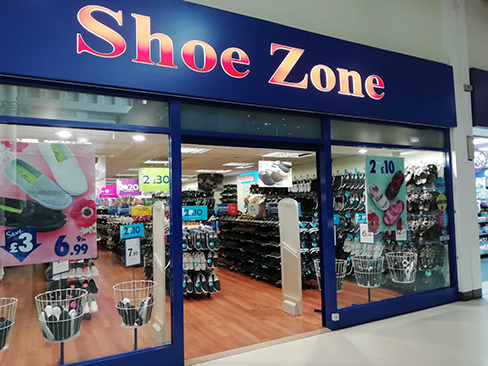 From my experience today I won't be in a hurry to return to Shoezone and I suggest the staff at Weston Favell are made aware of my comment so they can improve on there customer service. wanted some slippers that were warm and not to elderly looking and found some red Christmas slippers but not many sizes. On a previous occasion I had purchased two pairs of shoes which were very comfortable and exactly what I required. I returned to the shop to purchase a further pair of shoes of same design but in black which I did not purchase previously and I also purchased some mocassin slippers which I have purchased from this store on several other occasions. Was able to get the item I wanted, although there was a limited choice in the smallest sizes. The ladies in store were very pleasant and helpful. They were happy to advise the fit of my child's shoe and chatted to my children in a friendly manner. In returning an item that was faulty they were understanding and dealt with it politely.